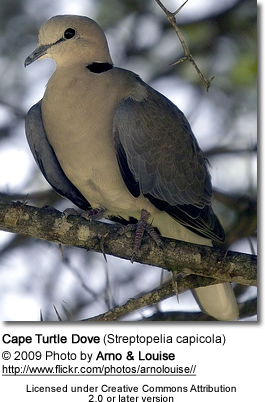 The Ring-Necked Dove (Streptopelia capicola), also known as the Cape Turtle Dove and the Half-Collared Dove, is a widespread and abundant bird in the bush, savannah, farmlands, and woodlands of southern and eastern Africa. Their name comes from a black patch of feathers on the back of their necks. The rest of their feathers are a pale brownish-grey, with darker colors on their backs. They also have white tips on the end of their tail feathers. 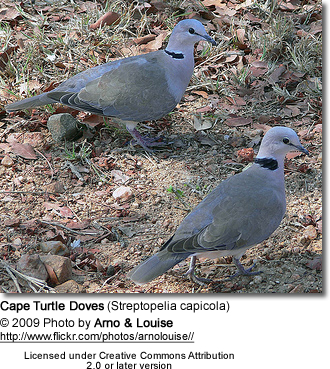 Males and females look alike, although the males are slightly bigger. They are usually around 27–28 cm (11 in) in length. 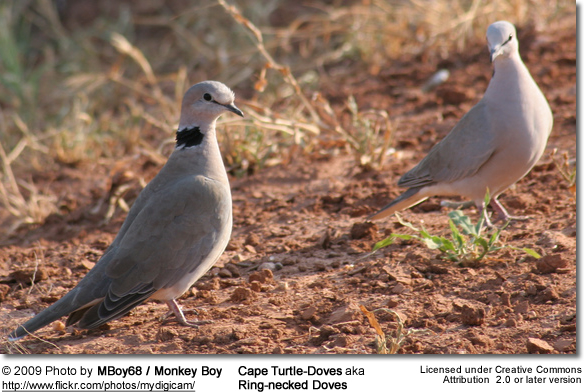 These doves are usually found alone or in pairs, although they do form larger flocks around sources of food and water, sometimes containing hundreds of birds. They are quite noisy in these groups, not only for the variety of calls they make throughout the day (and often into night), but also because their wings clap loudly when the birds take flight. Their usual call is a monotonous and high-pitched crooning sound, “Cooka-loo” which they repeat ten to thirty times. They have a second, cackling call that sounds like laughter. Because of the unusual sound of the birds' call, in the bush it is said that in the morning the call of the dove is saying 'work haaarder, work haaarder', and in the evening, the call is saying 'drink laaager, drink laaager'. 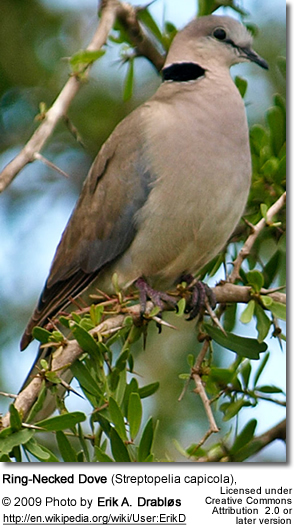 Ring-Necked Doves rest in treetops during the night and forage for food on the ground. They drink mainly in the morning. They feed mainly on seeds, but they also eat insects on occasion, especially flying ants. When they walk on the ground, their heads bob with each small step. 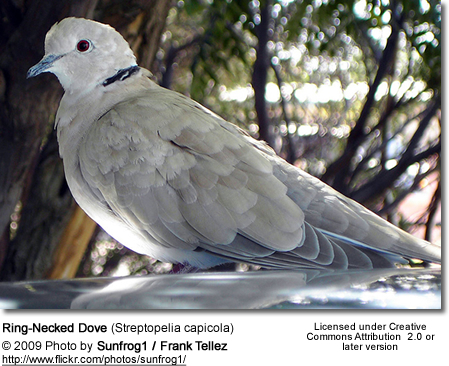 These doves breed at all times of the year, making flimsy nests from trees and rootlets in the forks of trees. They usually lay two creamy-white eggs per clutch, which are incubated for 15 days. The males sit on the eggs during the day, and the female at night. The chicks are ready to leave the nest after 14 days, and the adults are ready to breed again a week later. The male will continue to feed the young birds after the next eggs are laid.